U.S. singer-songwriter Anita Baker accepts the Lifetime Achievement Award onstage during the BET Awards at Microsoft Theatre in Los Angeles, California, June 24, 2018. 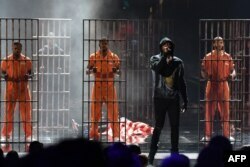 Meek Mill performs onstage during the BET Awards at Microsoft Theatre in Los Angeles, California, June 24, 2018. “We can't get used to these types of things. We're too used to young people getting killed,” Foxx said when speaking about XXXTentacion later in the show. Snoop Dogg celebrated 25 years in music, performing the classic songs “What's My Name” and “Next Episode.” The rapper also performed songs from his recently released gospel album, wearing a choir robe on a stage that looked like a church. 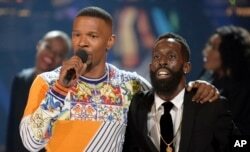 Jamie Foxx, left, and Tye Tribbett appear on stage at the conclusion of the BET Awards at the Microsoft Theater, June 24, 2018, in Los Angeles. Foxx entered the arena with a stuffed black panther toy - with a gold chain around its neck - which he handed to Jordan. The film won best movie. At the end of his speech he told the audience to travel to Africa and learn more about the continent's history. 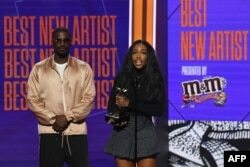 SZA receives the award for Best New Artist during the BET Awards at Microsoft Theatre in Los Angeles, California, June 24, 2018. DJ Khaled was the leading nominee with six and picked up the first award of the night - best collaboration - for “Wild Thoughts” with Rihanna and Bryson Tiller. He was holding his son on his hip onstage and also used his speech to highlight young people. “All of y'all are leaders and all of y'all are kings and queens - the future,” he said. Nicki Minaj performs at the BET Awards at the Microsoft Theater, June 24, 2018, in Los Angeles. “The power of black culture is unmatched. It's beautiful. It's amazing. It's everything. It's us,” she said. “And, it's Debra Lee, out,” she said as she dropped her imaginary microphone.